This is an excellent pie. The layers remain separate and distinct, and the flavors compliment each other beautifully. It's sure to be a hit on your holiday table. For the pumpkin layer, combine 1 egg, pumpkin, 1/3 cup sugar, cream, cinnamon, nutmeg and ginger. Spread gently over bottom of unbaked pie shell. 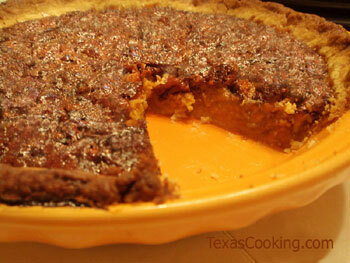 For the pecan layer, combine 2 eggs, corn syrup, 1/2 cup sugar, butter and vanilla. Stir in pecans. Gently spoon mixture over pumpkin layer in pie shell.